Clearwater Sinks > Lay-On Kitchen Sink With Right Hand Drainer 1000x500mm. 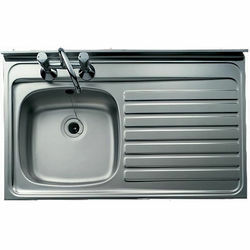 Clearwater contract Lay-On single bowl kitchen sink in stainless steel with right hand drainer (1000x500mm). Lay-On design: Fits directly on kitchen cabinet. Heat Resistant: Stainless Steel is highly heat resistant. Hygienic: A totally non-porous surface is easy to keep clean. Impact Resistant: Stainless Steel is the most forgiving material for impact. Stainless steel construction (0.7 gauge). Overall size: 1000W x 500D mm. 2 taps hole (180mm centres). Suitable for a pair of pillar taps or deck mixer style taps (sold separately). Clearwater Sinks & Taps have been a driving force in the UK kitchen industry. They trust they can offer the products that will achieve your dream kitchen at a realistic price. Crearwater have extensive knowledge of kitchen sinks and taps design that's second to none.